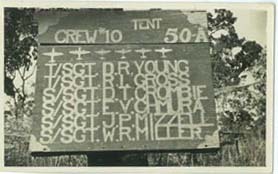 I just received a couple of pictures showing crew members and a handpainted sign outside the enlisted men's tent of crew number 10, 528th Squadron. I was wondering if any of the former members would like a copy of these photos. 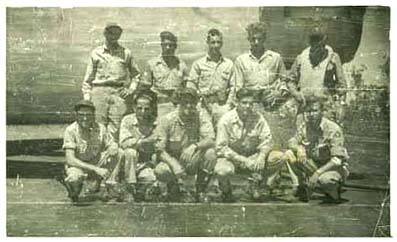 My uncle, W.R. Miller, S/Sgt, was KIA on April 28, 1944, as a member of Crew Number 10. Also, I have a news article describing the air battle in which my uncle was killed. Major Billy J. Smith, USAF (Ret). Some FYI for your newsletter. The Collings Foundation tours the country with the "Wings of Freedom" tour. Their planes include a B-24, B-17, B-25 and this year they have added a P-51. Their schedule including dates and locations can be found on the internet at http://collingsfoundation.org/. Since this is the only flying B-24, I am sure many of our members will be interested. I have enjoyed reading the interesting articles in Mail Call and the exchange of information between members. Could you please include my letter regarding information I am seeking about my father Sgt. Edward Grady McDonald. 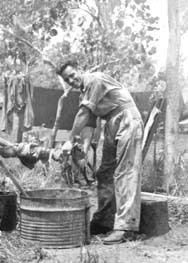 He served with the 380th Bomb Group, 528th Squadron, Engineering Maintenance Section, and was stationed at Fenton Airfield in Darwin, Australia in 1944/45. He may be remembered by the name of "Buddy" as he was called by his family. 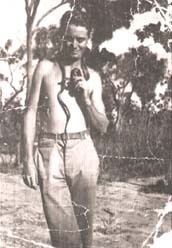 I have included 2 photos of my father and 1 of his friend (holding a snake) that he mentioned in his letters, Sgt.William (Bill) Wren. 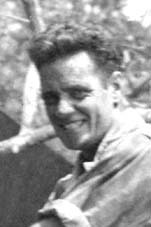 I would appreciate hearing from anybody who remembers my Father or Bill Wren during or after the war. I would like to thank you for all your work and the contributors to the newsletters for their memories and stories as this has given me an insight into my father's life and experiences during this period of his life.